We no longer carry this item, but we have a new sampler kit here! We've put these aromatherapy sampler kits together so you can test out some of our most popular essential oils. 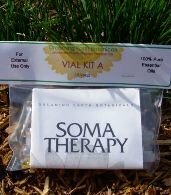 The 'A' kit includes twelve of our favorite and most versatile therapeutic quality Essential Oils. We include: Bergamot FCF Essential Oil, Eucalyptus Essential Oil, Geranium Essential Oil, Organic Lavender Provence Essential Oil, Lemon Essential Oil, Orange (Sweet) Essential Oil, Patchouli Essential Oil, Peppermint Essential Oil, Pine Needle, Rosemary Essential Oil, Tea Tree Essential Oil and Ylang Ylang #1 Essential Oil. Each of the twelve essential oils comes in a clear glass vial, 1/6 dram (.7 ml) - approximately 25 drops per vial. Two small droppers (pipettes) are included with each kit. If you need small pipettes, you can purchase them under Aromatherapy Accessories. Note: Normally ALL Essential Oils should ONLY come in dark glass containers (ours are in cobalt blue or amber glass) - our vials are a deliberate exception to the rule. They are in clear glass so that you can see color and clarity of the oils. The vials are not meant for long-term storage and should be stored out of direct sunlight and used within a few months.